WHAT IS IT? When it was first introduced four years ago, the all-white Mobius X8 knee brace was very Star Wars-looking. It looked like part of an Imperial Stormtrooper uniform (it can be ordered in a less-attractive gray/red combo). The wraparound, white, glass-reinforced plastic shell is highlighted by a Boa-style cable-tightening system and a full-coverage armadillo-style knee cup. The original Mobius X8 only came in three sizes, making for large gaps in the fitment possibilities. The Continuous Cable Routing System (CCRS) had a tendency to fray where the cables made tight bends, which would cause the cable to break. The armadillo-shaped knee cup could trap the liner of your pants when the knee was bent all the way, which would lock up the brace and make it impossible to straighten your leg. Riders complained that the dial that took up cable to tighten the brace would often seize and refuse to turn, even before the brace got tight, and, finally, the large X-shaped Kraton tendon back plate could cause irritation behind your knee. 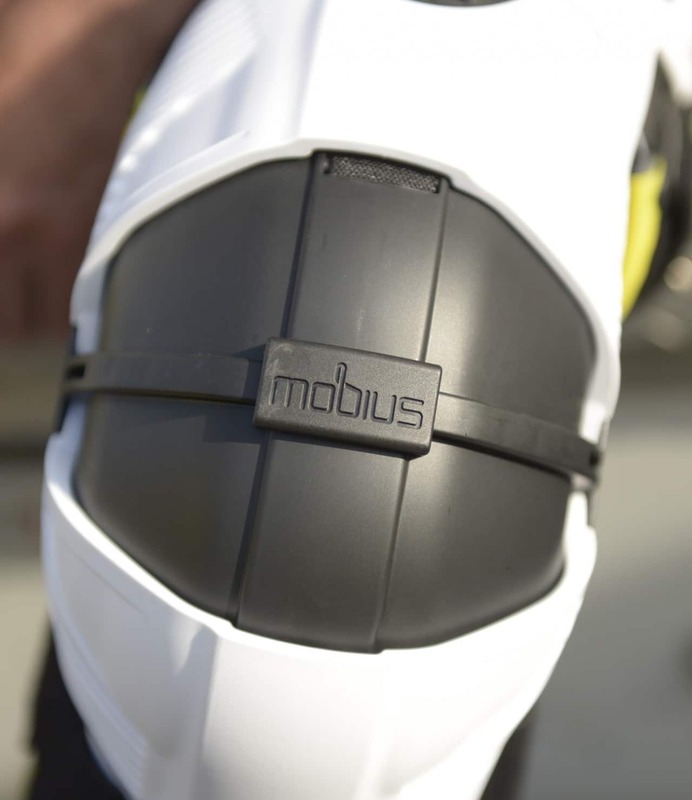 In response, Mobius has released a revised X8 knee brace that fixes the problems. CONTACT? www.mobiusbraces.com or (208) 928-7850. WHAT STANDS OUT? 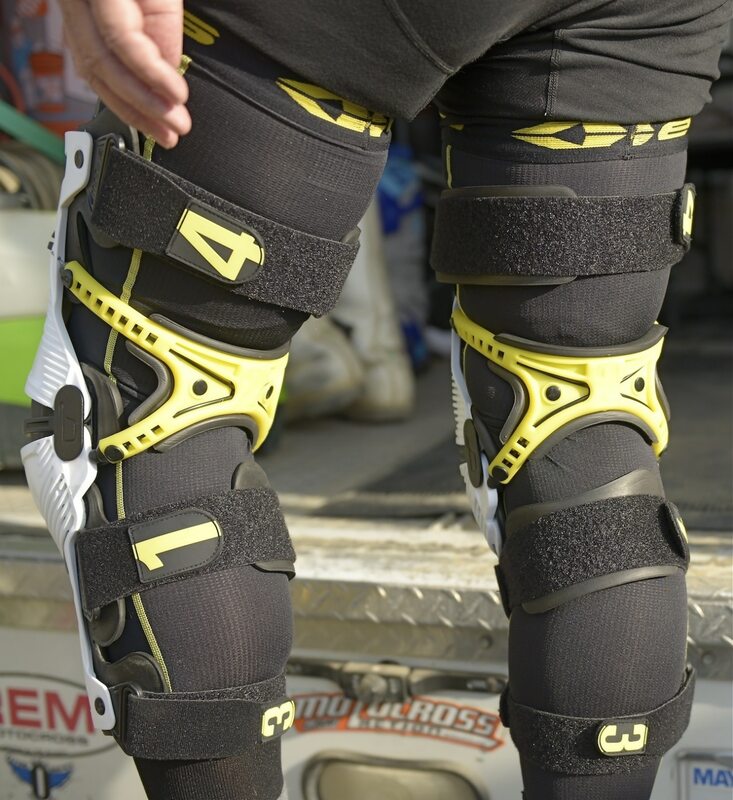 Here’s a list of things that stand out with the revised Mobius X8 knee brace. (1) Fixing the flaws. 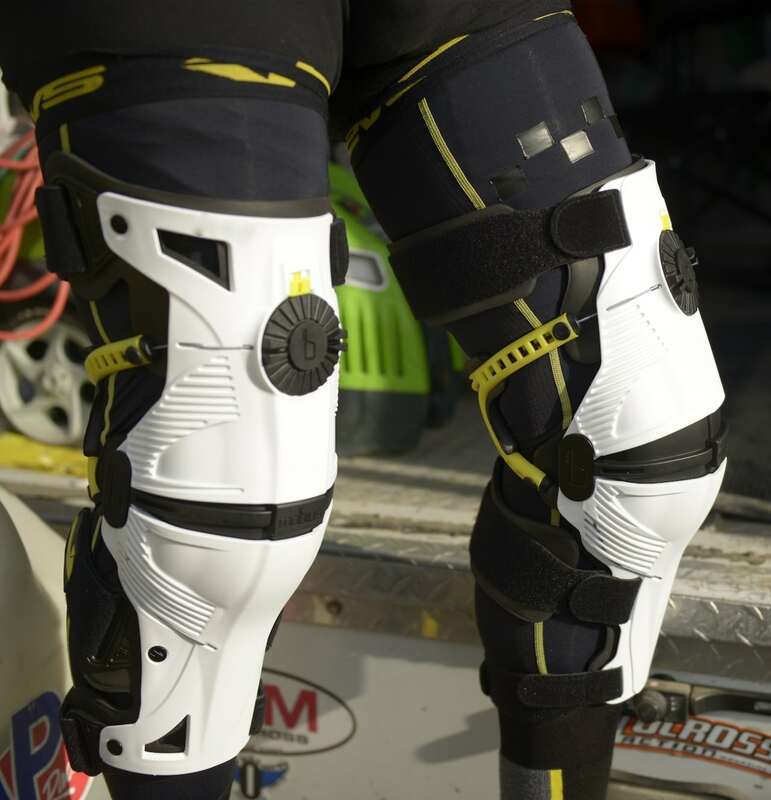 The new Mobius X8 knee braces now comes in sizes from extra small to extra-extra large. This is a big improvement, but there are other mods to the new version. Here is a quick list. Cable. The CCRS cables have been upgraded so they won’t fray (although we did break one of the new-style cables—we think it got pinched in the clamshell because it was cleanly cut. We orderded a new cable and installed it ourselves). Tolerances. Mobius tightened the tolerance between the armadillo knee cup shells (most MXA test riders cut the liner out of their pants just above the knee to keep the liner from snagging on the Velcros straps)). Ratchet dial. The ratcheting dial needs to be lubricated at regular intervals along with the cable, but if the dial does stick, release the ratchet system by pulling the yellow tab up (the brace tightens with less effort if the ratcheting system is disengaged). Tendon plate. The tendon back plate has to be carefully positioned in the cavity behind your knee before you start tightening the cable (it should be noted that if the tendon plate contacts the brace before the cable is tight, your brace is too large). These changes make a big difference in how the X8 fits and works. (2) Design. Apart from its Imperial Stormtrooper look, the most innovative facet of the Mobius X8 knee brace is its Continuous Cable Routing System (CCRS). Much like the Boa-style dials on cycling shoes, Fly pants, ski boots and mountain bike helmets, the cables pull a figure-eight-shaped Kraton tendon back plate against the back of the knee joint to reinforce the knee tendons. (3) Sizing. Make sure to consult Mobius’ sizing chart before buying. The chart asks for two measurements—width of your knee and circumference of your thigh (6 inches above the center of your knee cap). (4) Straps. In a nice touch, the straps are numbered to indicate the order in which they need to be tightened. Obey the order. The black plastic clip, with Mobius molded into it, can be changed by removing a small bolt from behind the knee cup. The brace comes with three different hyperextension stops. (5) Hyperextension. A removable extension stop is centered on the knee cup (shown above). Our braces came with the stock 15mm stop. There are optional stops—22mm, 27mm and 32mm. We ran the 22mm stop. (6) Performance. Excellent knee braces, not just because they protect the knee, but because they wrap around your lower leg to offer incredible area coverage. WHAT’S THE SQUAWK? As with all knee braces, there is a learning curve. The biggest hurdle with the X8 is getting comfortable with the tendon plate.